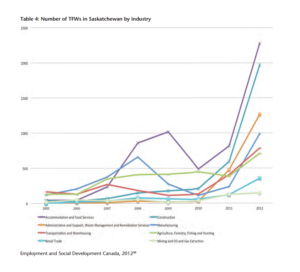 Most temporary foreign workers in Saskatchewan (62%) are employed in service-producing industries, with accommodation and food services (23%) as the single largest employer by industry, followed by construction (20%), administrative and support services (13%), manufacturing (10%), and transportation and warehousing (8%). Mining and oil and gas extraction, meanwhile, accounts for just 1%, or just 145 of the total number of TFWs in the province (Table 4). The rate of growth of TFWs in food services and accommodations is noteworthy. In 2005 there were just 45 foreign workers employed in the sector, but by 2012 that number jumps to nearly 2,300, or a 4900% increase! 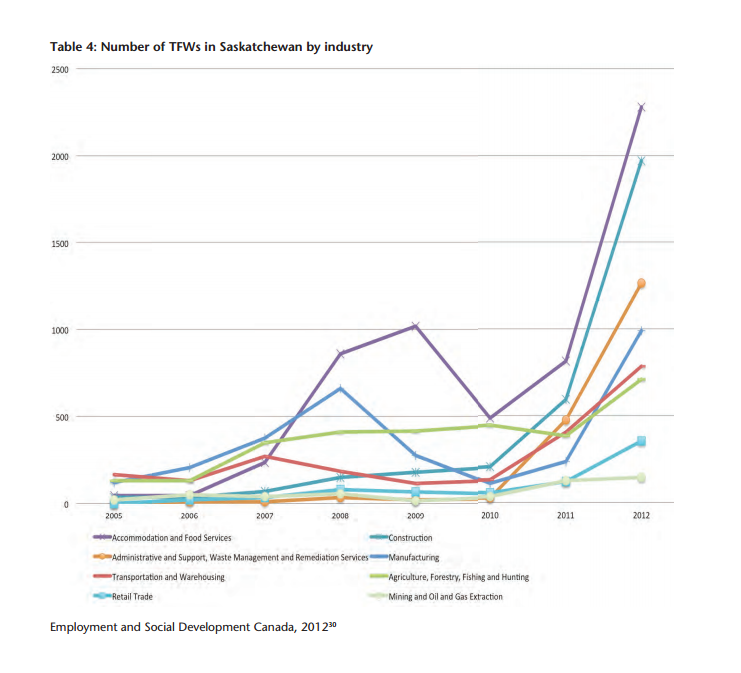 In just one year, between 2007 and 2008, accommodation and food services went from the fi fth major employer of TFWs by industry to number one, where it currently remains.